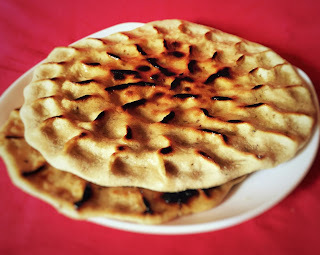 Khoba roti is a Rajasthani dish. It is thick, crispy outside and chewy inside. It is served with dal or any thick gravy. when I saw it for the first time, my expression was like this 👉😍. It is so enticing!!! Isn't it? Above all no master chef skills are required to prepare this beautiful dish. Yes! not even for this amazing pattern. How? !😦 Well, read the recipe to figure out. Ghee - 2 tbsp approx. Mix wheat flour, cumin seeds, salt and 2 tsp ghee. Now add little water to form slightly hard dough. Keep it aside for about 20-25 mins. Grease your hand with oil and knead the dough until smooth. Place a slightly big dough ball on the rolling plate and roll into 1/2 cm thick. Start pinching it to give the pattern as shown in the image above. It's time to be creative! You can use tongs/ scissors also to create so many patterns. I would love to see your creativity. Please share your roti's pic in the comment section below. Place it on a preheated pan with the pattern facing upwards. Reduce the flame. Let it cook very slowly. Pinching part can also be done after placing it on the pan. When it is cooked from one side and gets brown spots then flip it. Let it cook from other side too. It is cooked on very low flame so it takes about 10-12 minutes to be cooked properly from both the side. Roti is ready! Spread about 1 tsp ghee on it. Enjoy it with thick dal or thick spicy gravy of your choice.